Hard Knox sent me two more articles that I am going to publish over the near future. The next article, bound to appear in middle of June or so, will be quite extended and talks about airfoil choices. But first he is covering his understanding of angle of attack. Feel free to comment. The foil shapes for current long distance boomerangs have very little Chamber and Angle of Attack. As such they produce very little lift. The booms would in fact fall out of the air if they flew perpendicular to the spin axis. If the flight path is lined up parallel to the boomerang base plane, then these foils would not produce enough lift to keep the boom aloft. But, in reality booms fly at an angle to the base plane. The angle between the flight path and the base plane we will call the Bulk Angle of Attack. This is not to be confused with the Section Angle of Attack, which is the fixed angle carved on any segment of the boom relative to the base plane. The Bulk Angle of Attack is variable and changes throughout the flight. How does this happen? There are two ways. First, if the boomerang is not producing enough lift then it will begin to fall. This means the flight path will turn downward. But, the base plane will stay facing the same direction since nothing has been done to make it tilt in this case. As the flight path falls and the base plane stays the same the angle between the two (Bulk AOA) increases. The increased angle of attack causes the foils to produce more lift. The Bulk AOA increases until the lift matches the weight and the boom stops falling. Second, the lift force produced by the wings is stronger on one side than the other because the spin and forward motion combine so the velocity on one side is greater. This difference in lift causes a turning moment that causes the spinning boom to precess. This is basic boomerang physics we should already understand. But, that is not the end of the story. The boomerang axis has tilted but the boomerang is still going in the same direction. This time the boomerang base plane is tilted away from the flight path instead of the flight path away from the base plane as in the first case. But, that does not matter. The result is the same, the Bulk AOA increases, and again, the lift increases. But, this time the increased lift produces more turning moment. This is how a boomerang "bites" into a turn. These two ways of producing Bulk AOA (falling and precessing) are not really separate, but they act at the same time. For example, a boom flying straight slows down. The slower boom produces less lift and begins to fall. The fall increases Bulk AOA. The increase in AOA and Lift can produce more turning moment, which increases AOA and lift and turning moment and so on. So you see a boomerang can slow down and fall into a turn. This is significant because LD boomerangs need to be able to fly straight and turn. A boomerang that can fly straight with enough lift to support itself will have two halves: outer, and inner. The inner sections of the boomerang produce extra lift and positive turning moment, while the wing tips at the outer sections produce enough negative lift and negative turning moment to prevent the boom from turning. When the boom slows and falls into the turn the Bulk AOA causes the wing tips to produce positive lift as well. 1. Air velocity at the wingtips bigger than the speed of the boomerang (no torques). In this situation the boomerang with a negative lift airfoil will begin to fall as any other boomerang (Example: hovering MTA or even a hovering Voyager!). The speed downwards will increase until gravity equals drag/ up wards lift force. Here it is the classical angle of attack which plays its key role. Hard Knox goes deep into the matter. My feeling for a long time has been that the aerodynamics of LD booms and standard ones are VERY different. The fact that the LD boom goes straight out, then turns on a relatively narrow hairpin and flies back straight again indicates, as has been mentioned, that there are these two flight regimes. The determining parameter is the forward velocity of the boom, or, to be more precise, the "advance ratio" u, which is the ratio between angular (rotation) and forward speed. u > 1 means that the receding wing tip is in reverse flow. As to the two phenomena leading to an increase in the bulk angle of attack. The comment I would like to add is: if the asymmetric lift distribution causes a moment that increases the bulk AOA, which will then increase the magnitude of this moment (positive feedback), then we will most likely end up with a "left" flightpattern. To avoid this, I presume, we have to make sure that on the way out, the moments acting on the boomerang disk should be as small as possible, just enough lift to keep the boom in the air.. The advance ratio Lorenz refers to, u, is related to the wheel radius in the previous topic. The advance ratio u = 1 at the wheel radius. Outside the wheel circle u < 1, and the flow is non- reversing. Inside the wheel circle u > 1 and the flow is reversing. 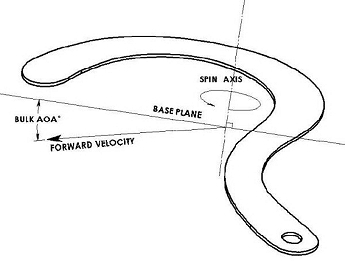 High speed throws can often have high u values meaning the wheel circle is larger than the boomerang disc and the entire receding wing is in reverse flow. As the boomerang slows, the wheel circle begins to close and the wing tips extend outside the wheel circle, no longer in reversing flow. The transition from reversing to non-reversing flow may be useful for shaping the flight path. But, advance ratio is quite different from Bulk AOA, which governs how much lift is generated by the wings, and thus how much turning moment. Manuel s second flight regime leads me to believe there are actually three flight regimes. The first and second regimes are mentioned by Lorenz: the standard turn, and cruising straight. The third is the negative turn at launch caused by negative lift at the wing tips. This negative turn is responsible for the "Dive" flight pattern mentioned in the book "LD". LD Boomerangs have negative lift at the wing tips to counteract the turning moment of the rest of the wing. If the forward velocity is high enough the total lift may exceed the boom weight. In this case the boom will rise instead of fall. The rising flight path produces a negative Bulk AOA and thus a negative turning moment. The boom must be launched at a steeper angle, since the negative turn would cause the boom to turn downward. As the boom climbs after launch, the negative turn rotates the boom more level to the ground. Also, some of the kinetic energy is transformed to potential energy (altitude) causing the boom to slow down and the Bulk AOA to become positive. Kinetic energy is quickly dissipated by drag (drag and kinetic energy are both proportional to velocity squared). So, storing some throw energy as potential energy is beneficial. As for the "Left" flight pattern, Layover moment is the governing factor. Layover moment has three possible regimes as well: Positive, Neutral, and Negative. Forward velocity and Bulk AOA are the controlling factors for Layover moment. However, depending on the boomerang shape, the positive layover moment may happen during the positive turn regime OR during the negative turn regime. The Voyager shape has negative layover moment coinciding with positive turn moment. Traditional booms tend to have positive layover moment coinciding with positive turn moment. I have not yet decided which is more desirable. I too find this phenomena fascinating. In my throwing and study what you call BAOA I find more useful to term as planar momentum because AOA etc relate more to fixed parameters of the boom that cause particular actions. Whereas rotational, angular and planar momentums are evolving forces that are experienced by the boom in flight caused by external forces acting on the boom rather than generated by the boom structure itself. I wrote several long posts on the Yahoo LD group a couple years back exploring my observations in this regard, particularly because I had not seen any literature regarding this process and field observations suggested to me it was a large part of what was happening in flight. Whatever you call it, I do not think this phenomenon has been explored enough. And your article is great food for thought. For a while I have been thinking that Felix Hess, or rather his thesis, has something to offer on this topic. He explains how throw sticks can fly mostly horizontal over long distance when thrown side- armed. The normal lift distribution for a throw stick would be shifted towards the leading arm side because more lift is generated on that side, and normally that would show up 90 degrees later as a force that tries to lift the front. Clearly, this does not happen, so what is the trick? The trick is that the throw stick is carved or turned such that negative lift is generated at the tip. The negative lift is further from the center, so it has more "leverage" than the rest of the arm. It can shift the center of lift back towards the center while the overall lift remains positive, keeping the throw stick aloft. His simulations show a flight path that remains more or less level, but climbs near the end. I do not recall the cause of the rise at the end being discussed, but it seems likely that the negative lift at the tip becomes less effective as the throw stick slows. Contemporary LD booms seem like they have a lot in common with throw sticks. If the tune is a little off and you do not aim high enough you can get a similar flight path, right? Maybe what Hess describes for throw sticks applies to LD booms as well. In this view the plane of rotation of the boom could be the same as the plane of translation. There is no need to tilt the front upwards to generate lift. The boom stays aloft because the airfoils generate enough lift to counteract gravity. Perhaps the normal case is that the front of the boom is trying to rise, and the boom is trying to precess all the time, but during the high speed portion of the outbound and return flight path forces at the tips hold these tendencies in check. We need something that accounts for the different behavior when the boom is "cruising" versus "turning", this seems like a good candidate to me. In this view the function of the upwards launch angle is not to keep the boom aloft, it is to slow the boom so it will turn.